The recent installation convocation meeting’ of Sandylands Chapter No 5702 will be remembered by the companions of the chapter for some time to come, not just because the Grand Superintendent Tony Harrison was present (well it is his chapter), but also for the superb ritual undertaken by the main players in the ceremony and the surprise promotion of one of its longest serving officers, chapter secretary Stewart McVernon. 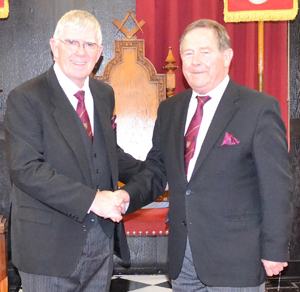 Tony Harrison (left) congratulates Stewart McVernon on his well-earned promotion. Towards the end of the convocation, the Grand Superintendent promoted Stewart to the high rank of Past Provincial Grand Scribe Ezra, for his services to the chapter, the Royal Arch and Masonry in general. Stewart has been secretary of Sandylands Chapter for 14 years, as well as serving 4 years as secretary for the Provincial Grand Stewards Chapter of West Lancashire No 8516. On top of this he has been secretary of Poulton Le Sands Lodge No 1051 three times (twice before amalgamation and once since), amounting to 17 years in total; Stewart had certainly earned his reward. This “super ceremony”, as it was later described by grand officer Philip (Phil) Gardner, was further decorated with the presence of Assistant to the Provincial Grand Principals Christopher (Chris) Butterfield. As well as Phil, grand officers Keith Kemp and John Robson were also in attendance, together with Provincial Grand Scribe Nehemiah Dave Case and fellow acting Provincial grand chapter officers Andrew Bartlett, Tony Cassells, David Tattersall, Peter Pemberton and Chris Larder. Tasked with organising this grand parade, was Provincial Deputy Grand Director of Ceremonies David Thomas, who was assisted by PDGDC designate Barry Fitzgerald. Also present to support Tony, was the Lancaster and District Vice Chairman Scott Devine. On being introduced to the Grand Superintendent, the first principal Raymond Griffiths welcomed Tony and as is traditional, offered him the sceptre. Tony replied that it was a delight to be in attendance at his own chapter and that it was nice to see it so full, adding I “know the ceremony will go well, because I am returning the sceptre to you”. Following the return of the sceptre the installation convocation commenced. The ceremony saw Allan Finney duly inducted as first principal, having already served in that office on a previous occasion, Carl Horrax taking the purple robe of the second principal and Michael Craddock the blue robe of the third principal. Pictured from left to right, are: Raymond Griffiths, Allan Finney and Michael Craddock. The robe addresses to the first, second and third principles were delivered in fine fashion by Raymond Griffiths, Stephen Fox and David Shaw respectively. At the completion of the ceremony, the Grand Superintendent rose to offer his sincere congratulations to the three principals “on achieving their respective chairs”. It was, in Tony’s words an “impressive ceremony” and congratulated the immediate past first principal Raymond on his excellent standard of work throughout the installation. Tony was delighted to acknowledge the donations made to charitable and worthy causes over the last 12 months. The beneficiaries of this generosity were revealed to be the MCF 2021 Festival £454.50 (which included £304.50 collected from the white envelope scheme) and £85 to each of the group initiatives. On their behalf, Tony expressed grateful thanks. It was at this juncture that David Thomas stepped forward to accompany Stewart to receive his promotion from the hands of the Grand Superintendent, who thanked Stewart for his dedication to duty. A ‘patent’ of appointment was then read out by Chris. A very surprised Stewart was then escorted back to his place in the chapter. 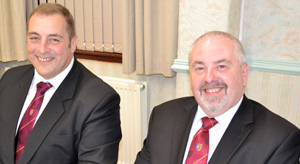 Scott Devine (left) and Chris Butterfield relaxing at the festive board. At the festive board, held in Morecambe Masonic Hall, Chris Butterfield responded to the toast to the grand officers by firstly congratulating the chapter officers for all their hard work in making the ceremony so enjoyable. Chris then moved to toast the health of the Grand Superintendent by expressing his delight at being in his company, adding that Tony has been at the head of our Province for nearly five years, the time has flown by, but in that time, his dedication to duty and his wish for us all to enjoy our Freemasonry, remains constant. On replying to the toast to his health by Chris, Tony first expressed his pleasure on an excellent evening and hoped all the companions present had also enjoyed it. He once again congratulated Stewart on his promotion as well as the other companions present who would be receiving appointments or promotions at Provincial Grand Chapter. Tony then expanded upon a number of issues, in particular the need for all companions to consider themselves membership officers and “to try and encourage Craft Masons to consider joining the Royal Arch and complete their journey in Freemasonry”. The new on-line learning tool Solomon was also discussed, as well as the MCF 2021 Festival. Tony thanked the chapter for their donation to the MCF, as well as those companions who had made their pledges to the festival and to those who were still yet to do so, he hoped they would consider it as soon as possible. In response to the toast to the Provincial grand officers, David Case stood to thank the chapter for inviting him. It had been a hectic year for him so far, he said, but was thoroughly enjoying his time in office. Following an inspiring toast to the three principals by Raymond Griffiths and the response by Allan Finney, it was time for the companions to retire and reflect on a most interesting and enjoyable evening. Pictured from left to right, are: John Robson, Scott Devine, Tony Harrison, Carl Horrax, David Tattersall, Andrew Bartlett, Allan Finney, Peter Pemberton, Michael Craddock, Chris Larder, Chris Butterfield, David Case. Keith Kemp, Tony Cassels and David Thomas. Article and photographs by Paul Thompson.